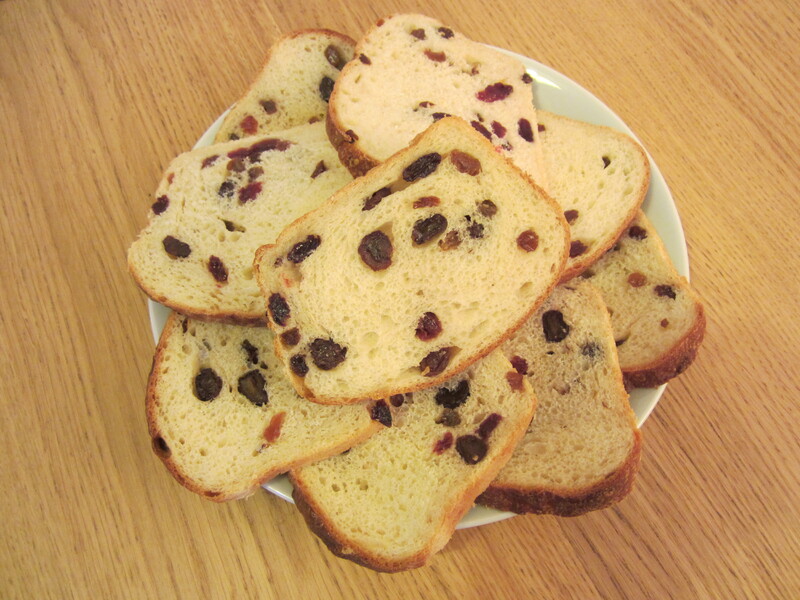 This is a Christmas bread – it fills the house with the aroma of orange and spice when you bake it – but it is not a stollen. It is a bit lighter so you could eat it for breakfast or with a cup of tea mid-morning in early December, just to start getting you in the mood for the festivities ahead! The Lemon Brioche recipe is a variation suitable for any time of year. Mix the ingredients together and leave at room temperature overnight. Mix the ingredients for the biga together briefly in a small bowl, cover and leave at room temperature overnight. Mix the ingredients for the fruit mix together in a small bowl, cover and leave at room temperature overnight. Place all the ingredients for the dough in a large bowl, mix to form a sticky dough and then knead for around ten minutes until it is smooth and elastic (but it will remain sticky). You may find it easier to air-knead or use a machine. Put the dough back in the bowl, cover and leave to rise for about an hour and then place in the fridge overnight. Once chilled, the dough will be much easier to handle. Mix the ingredients for the creme d’amande together and then chill briefly in the fridge. Remove the dough from the fridge and gently incorporate the fruit mix into the dough, trying to cover all the raisins with at least a thin film of dough (to prevent them burning when cooked). Preheat the oven to the highest setting. Brush the loaves with a little milk and place in the centre of the oven. Reduce the temperature to about 200C after ten minutes and cook for a further twenty minutes, keeping a close eye on the loaves as they can go very dark, very quickly. Once cooked, remove to a cooling rack and dust with a little icing sugar. Incorporate the fruit after the first rising as described above, then shape the dough into a loaf and place into a large loaf tin before baking as described above. 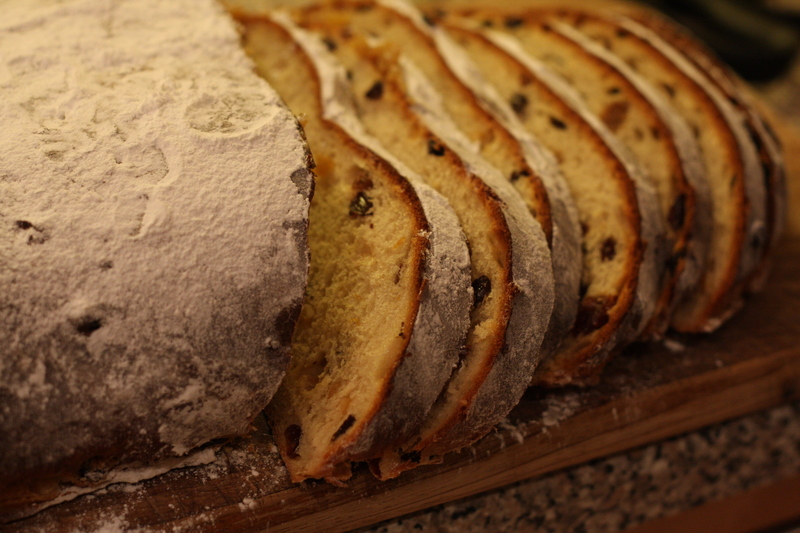 * I have to confess to having borrowed Richard Bertinet’s creme d’amande recipe from his recipe for Stollen which appears in the December 2011 edition of Delicious Magazine. I will link to the official recipe once updated on the Delicious Magazine website.